The long, bright streaks that reach out from craters on the moon are actually much longer than they appear, according to research published in the journal Icarus. 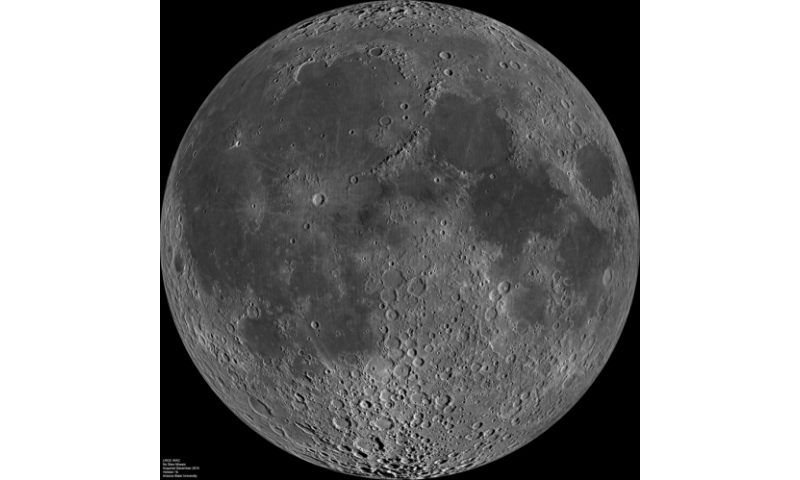 "The intense radiation and impact environment of space changes the composition of the thin upper layer of the moon over time, causing it to darken," said David Minton, a professor of earth, atmospheric, and planetary sciences at Purdue University. "Just underneath that is fresher, brighter material. When a crater impact throws up ejecta, it splashes that material onto the surface, and that becomes a crater ray." This means the brightest visible rays on the moon were created by the most recent impacts. Most craters don't have rays, and it's because they're fairly old, Minton said. Jacob Elliott, a graduate student at Purdue, mapped some of the moon's crater rays, their length and the size of the crater they emerged from, to create an equation that describes this phenomenon. A prominent planetary scientist in the 1970s observed the relationship between the size of a crater and the length of its visible ray, but never provided a physical explanation for it. "We basically say that this crater has to be a certain size in order for its ejected debris to break the dark layer of the surface. This will bring bright material to the surface, creating the rays that we see," Elliott said. Crater rays also exist on Mars, but they're significantly longer than their counterparts on the moon (at least to the eye) because the weathering process is different. Elliott thinks the rays on the moon are probably longer than they appear, but he measured what he could see.